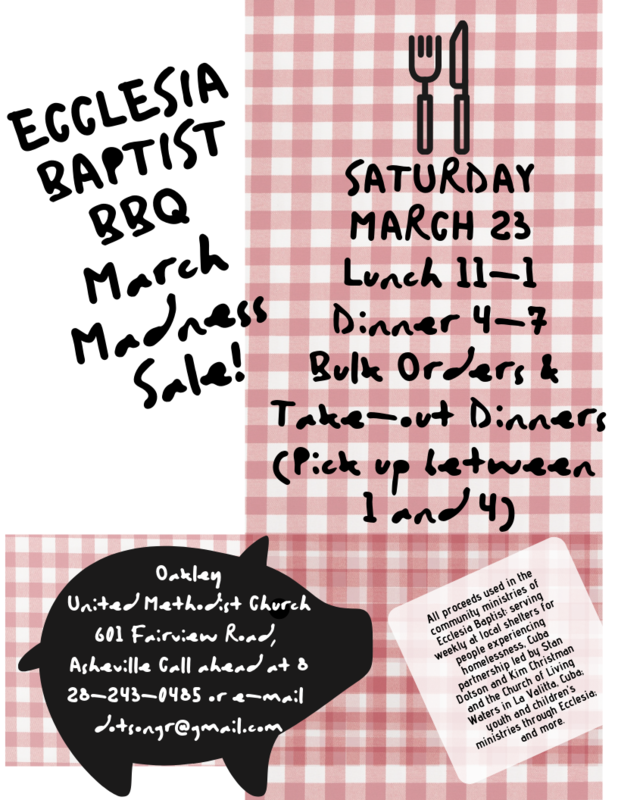 Support Ecclesia and enjoy delicious home-cooked BBQ! Join us on the day, or order in advance and we'll have it ready for you when you arrive! It's GOOD TO THE BONE! Serving breakfast to veterans on the 1st and 3rd Saturday morning of each month. Cook at 6 am and serve at 7 pm. ​We prepare and serve approximately 125 men each breakfast. Lunch each Wednesday, prepare and ready to serve at 12 noon. We serve approximately 20 ladies and children each lunch. ​Dinner on the 1st Sunday night each month and the 4th sunday night June, August, October, and December. Prepare and ready to serve by 6 pm. We serve approximately 30 ladies and children dinner each night. Each Thursday night during the season, we manage the concession stand at the baseball and softball fields behind Fairview Elementary School in order to free the parents and grandparents to enjoy their children's games. We start prep work at 5:30 pm and open concession at 6 pm. Ecclesia’s missionary effort in Cuba is led by its members Rev. Stan Dotson and Rev. Kim Christman. Stan and Kim have led many teams from Ecclesia (as well as other churches across the USA) to develop partnerships throughout Cuba. ​Our partnership is with Rivers of Living Water Baptist Church in La Vallita, a small village in the middle of the island. In contrast to traditional models of missions, where one side seemingly has all the resources presumably to fix the problems of the other side, our mission is mutual; our two churches are accompanying each other, learning from, and supporting each other. The La Vallita Church is teaching Ecclesia a lot about how to foster community and live more simply. Ecclesia has been helping La Vallita with a sustainable agriculture project for the community's economic development, and with funding a music academy for worship leadership. Donations to this ministry helps sustain Ecclesia's partnership and Stan and Kim's continuing work in Cuba. We value your financial contributions to Ecclesia. Thank you for partnering with us in this tangible way! Please click the DONATE button to proceed with your secure donation. ​contact us and we will find a place for you to serve!